We warmly invite you to this year's Culford Golf Day, returning by popular demand after the success of 2018's event. 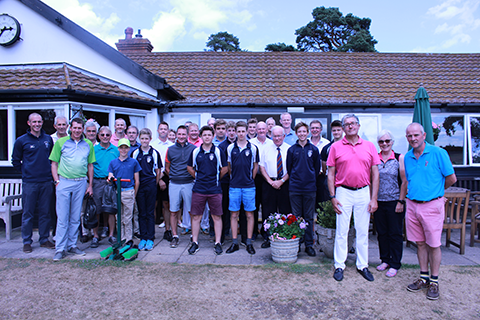 The day will take place at Flempton Golf Club on Friday 7 June 2019. The event starts at 09:00 with coffee and bacon rolls on arrival. Teams will be split amongst academy players, parents, OCs and guests, who will compete in a Texas Scramble with prizes awarded at its conclusion. After a buffet lunch, there will be an opportunity to take part in a putting clinic with Culford School Head of Golf, former European Tour player and PGA Professional Lawrence Dodd. The cost for the day is £50.00 or £25.00 for Flempton Golf Club members. Places are limited and will be issued on a first-come, first-served basis. Please click here to view our event booking, cancellation and refund policy. All donations, of any value, are welcomed and can be added to the cost of your ticket. Culford School is a registered charity (no.1142794) and donations made through ticket booking will go towards The Campaign for Culford for the benefit of current and future Culfordians. Thank you for your support.